Paul took this photo on Friday while we were visiting with friends at their apartment in Granger Bay. What we didn't realise at the time was that the glass roof that will cover the stands (but not the actual pitch, apparently) is now on its way up, supported by a massive network of cables that are slowly being tightened. The roof weighs around 4,500 tons - that's a whole lot of elephants. 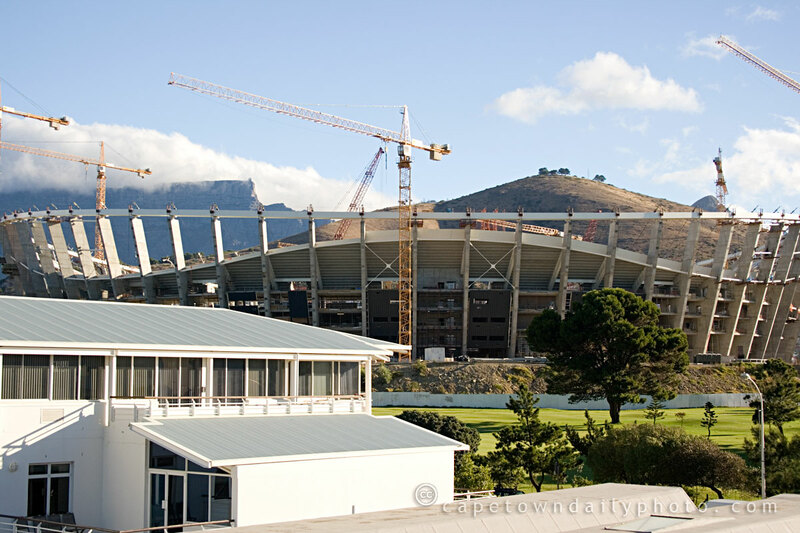 You can read more about the process involved in getting this roof up to where it needs to be on the Shine 2010 site, and you can see a whole bunch of great pictures from inside the stadium on the official City of Cape Town website. Can you believe that we are just over a year away from the 2010 World Cup? The first round of ticket sales starts on Friday, and I must say, the reality of the awesome party that awaits us is starting to set in for me. If you're keen to get your hands on some tickets (and I can't see why anyone wouldn't be! ), then read this official FIFA information on how tickets will be allocated. Posted in News and tagged 2010 world cup, construction, signal hill, sport on Wednesday, 18 February, 2009 by Kerry-Anne. This stadium will be one of the flagship stadiums for the 2010 SWC. I can’t wait to see the the stadium and Green Point Urban Park being completed, I’m starting to imagine how it would be in 2010. Well it should all be completed on time as we can confirm that they are working ’round the clock’ 7 days a week to have it ready for 2010 and when we watch the matches from it back in the UK next year I will at least have the memories of seeing it being built!! If your readers would like to see more pictures of the ongoing progress of the stadium, one of the consulting architects created this flickr group a while back : http://flickr.com/groups/capetown2010/ with a fair amount of contacts keeping it up to date with regular pictures.